It’s a debate that’s been raging for years and will likely continue to do so. Is Apple Mac better than PC or is PC better than Apple Mac? Both sides of this debate have extremely loyal users to fight their corner, but we want to know is there ever going to be a winner? Or is it completely down to personal preference? Photoshop and the Adobe Creative Suite started on the Apple Mac, so naturally, they became the go-to machine for designers lured in by superior software. Since then, however, something stuck and designers have always favoured Apple Mac over PC not only for the quality but also the tradition and reputation the brand has built up over the years in the creative sphere. Because of this brand loyalty, software companies will, more often than not, target design tools and software towards Apple Macs. Apple puts a strong focus on fonts and colours, especially between screen and print files. Apple is ‘hyper’ aware of their brand reputation and always go out of their way to maintain their signature allure as a ‘designer’s computer’ and nothing seems set to change that. The operating system (OS) is one of the fundamental differences between Macs and PCs. Generally speaking, Apple Macs run OS X software and PCs run Windows software. Once a user becomes comfortable with a type of software and interface, they usually don’t want to change. Which is often cited as a reason why designers continue to use Macs. When Windows 8 was launched, PCs saw a dip in popularity, but they have managed to rebuild their reputation following the launch of Windows 10. An excellent salvaging operation that renewed PC user’s faith in the brand after the trainwreck that was Windows 8. Macs are known to fall victim to substantially fewer attacks than Windows PCs. However, especially with the rise of ransomware, it must be said that no matter what your operating system or machine, using anti-virus software, is always a must for any user as hackers are constantly adapting and becoming smarter across all platforms. Apple connects its Mac and iOS devices seamlessly, so it’s easy to share everything between devices, even to the point where you can start an email on one and finish it on another. Although you can sync your mobile devices with a Windows PC, the convenience and smart integration software present in Apple devices is a great selling point. People working in creative industries like; Graphic designers, Architects, Artists, Editors etc… rely on a high level of accuracy to ensure the quality of their work isn’t hindered. Product reputation is a big factor in purchasing decisions. Apple typically build their Macs to the highest quality standards, paying attention to every detail in both functionality and design. The finished product is not only often elegant and stylish on the outside but on the inside as well. There’s no denying that you can build your own PC which may be more powerful, or buy a ready-built PC with just as great a spec, but there is something about the Apple Desktop that is inherently cool and perfect for a creative office trying to project a brand message onto both its customers and employees. In order to achieve such a slim and sleek design, Apple has compromised the possibility of custom upgrades, which can almost always be done with PC. A PC allows you to customise your machine whenever you like. Most creatives not only want but also have to have access to cutting-edge technology and keep their devices up to date. That is why our Hardsoft UK leasing service is ideal for Apple Mac users, as you can upgrade their device after 24 months like you would a mobile phone contract. Year after year, Apple continues to rank as one of the best customer service providers amongst big brands. If you ever have a problem or query about your device, you have the comfort of knowing Apple is there online, over the telephone, or in store for support. At Hardsoft UK, along with every computer leased, you’ll receive a three-year warranty complete with over the phone technical support. So, no matter what or when there will be someone available to help you! Overall user satisfaction is ultimately one of the defining factors when it comes to whether you will stick with a brand in the future. The price of the product needs to provide value for money for the user and it’s not often we hear of Apple Mac users regretting their purchase. The overall verdict is that creative industries generally side with Apple Mac models. There will be exceptions to this, of course, but Apple Mac just pip PCs to the post in the creative world. 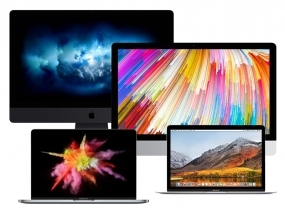 Here at Hardsoft UK we offer rent, hire, and leasing for a range of Apple Mac and PC models. We’re a one-stop shop for all of your IT leasing needs. The beauty of it is that you can be at the forefront of the IT industry with the latest models when taking advantage of our leasing service. Perfect for both start-ups and well-established business.